James Raggi's Lamentations of the Flame Princess: Weird Fantasy Role-Playing. Some of this ground has been covered elsewhere. I wrote a review of D&D (and an addendum), and as a variation of a game containing subterranean lairs and reptilian monsters, Lamentations of the Flame Princess: Weird Fantasy Role-Playing covers a lot of the same territory. Additionally, noisms already covered my feelings on the game. It's simple, it's intuitive, it's fast, it's basically D&D. Boom. The Grindhouse Edition (I haven't seen the original and the hardcover has not yet been released) is a box set of three books, a pile of character sheets, and a set of tiny dice; basically everything one needs to play the game. The three books are Rules and Magic, Tutorial, and Referee. Rules and Magic details what one would expect: the rules of the game (patterned after B/X D&D, among other things), character classes, spell lists, et cetera. Tutorial is a classic solo game. The first part depicts a similar setup to Death Love Doom — you're a lone adventurer who hears about an abandoned house, and you decide to loot it. 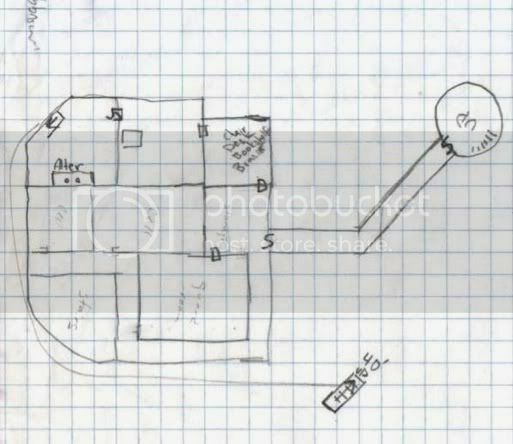 This part is a fairly linear setup with few choices; there are a couple of rolls to get new players used to the system, but it culminates in running into a friendly Cleric, fighting an evil sorcerer, and getting bitten by a zombie. The second part of the adventure, which features the more standard choose-your-own-adventure with dice rolls format of solo adventures, depicts your character's return to the house to find a cure for his zombie-induced illness. I will admit, it's fairly nerve-wracking — time is running out, and even if you've found a solution, you have no way of knowing whether it's the correct one until the time comes. Referee contains rules and advice for running games in the vein of the weird tale. The watchword of the game is mystery; Mr. Raggi includes no bestiary, because monsters should be unique, although he describes several monsters and suggests how they might be integrated into a game. The book ends with some conversion notes regarding other retroclones; an adventure, "A Stranger Storm;" and a couple of charts for DMs. As written, the game is fairly compatible with other retroclones, and only has one notable quirk which requires translation: it uses a silver standard rather than a gold standard (Weird Fantasy Role-Playing's implied setting is early modern, which led Mr. Raggi to use the silver-rather-than-gold standard for XP and treasure). Of course, there are guidelines in Referee. As noisms noted, the game is fairly simple. Some rolls (like reaction rolls) have special rules, but most actions fall under skills or combat. Skills keep the standard "x in 6" chance mechanic, except that this is how they're defined. Every person starts with a 1 in 6 chance of using a skill (demihumans may have different chances, of course), with bonuses or penalties depending on the situation (so the classic 1 in 6 chance of detecting secret doors or 1 in 6 chance of opening stuck doors are conserved). Specialists (the rough Thief analogue; Specialists, however, might also represent sages or scientists, as well as the typical rogue) can spend skill points to increase these chances. In addition to typical skills such as Climb and Search, there are also specialized skills such as Architecture and Bushcraft which can represent specialized fields of study. Combat is familiar to 3e fans — roll 1d20, add modifiers, and compare against the opponent's Armor Class. Simple. The other notable tidbit is how the classes are specialized, and don't really multiclass or move outside their roles — Fighters hit things, Specialists know things, Clerics are religious magic-types, Magic-Users are arcane magic-types, Elves can fight and cast arcane magic, Dwarves can fight and take heaps of punishment, and Halflings have excellent saves. Everything else regarding the game lies in the implied setting. As noted, the artwork suggests that the world is early modern, right in the thick of exploration and the early stages of globalization. Modules and supplements continue this trend (Weird New World takes place in an implicit fantasy Canada with totally-not-Inuits; Death Love Doom explicitly takes place in 1625 London undergoing the transition from King "My-Name-Is-on-a-Bible" James to King "Decapitated-by-Puritans" Charles; and The God that Crawls will supposedly include more early modern goodness, like rules for converting demihuman classes to human classes and rules for firearms). The domain level has been removed; instead, there are rules for purchasing real estate and making investments, so characters with the wealth can establish "domain level play" whenever they can afford it. Magic-Users have spells with odd effects, and the most famous LotFP spell at this point is likely Summon, which generates a unique creature when it is used. The game is fairly solid overall. The biggest complaint typically centers around the lack of a bestiary, although DMs wanting to use this as straightforward D&D can do so with any other old school bestiary; they're basically all compatible. The combination of simplicity and weird/horror/fantasy dings everything I like about a game. If either of those points seems interesting, you should take a look; you can download free rules at the website. The final point — something the free rules won't show you — is the art. Lamentations products always have beautiful artwork, and the Grindhouse Edition box set is no exception. As befits the implied setting, some of the artwork is gritty and graphic (there are some savage wounds, a monstrous birth, and a medusa with a young paramour or two), but it's all fairly gorgeous. The center of the book bears color prints, while the rest is in black-and-white. As with most Lamentations products, this is two-column, A5. I really like LotFP; it's probably my favourite version of D&D, but I do have one problem with it, and that's the way that the implied setting and the cash-for-experience mechanic don't seem to get on with each other. I'm sure there's a way around it, but I haven't figured it out yet. I think that, at the very least, the Referee book is worth the price of admission. Extremely useful stuff, and the best advice in it is effectively systemless. I don't particularly care for the shock value of the art direction. I don't think it generally adds much except the need to disclaim that OMGIT'SSOSHOCKINGDON'TLETYOURMOMCATCHYOUREADINGIT. I'm not compelled to read the art-free version or anything; it's just kinda eyeroll-worthy, and very much worth looking past.